Welcome to the 12th issue of the ChemPubSoc Europe newsletter. Please read, enjoy, and recommend to your colleagues and students! 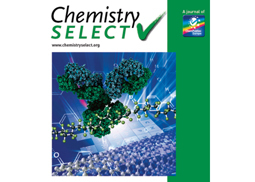 ChemistrySelect is the latest journal from ChemPubSoc Europe covering all areas of chemistry and adjacent fields. With a focus on scientific rigor and accuracy over perceived importance and impact, ChemistrySelect offers researchers around the world a quality society-owned journal in which to publish their work. The journal is currently free to read, and there are no charges to authors. 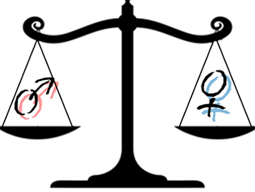 In celebration of International Women’s Day 2016, Chemistry – A European Journal has taken look at gender parity in the sciences and dedicated a Special Issue, edited by Claire D'Andola, Senior Associate Editor, to women worldwide currently working in chemical research. Enjoy free access until September 30, 2016, and discover the great contributions women are making to chemistry. 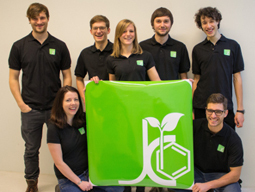 Seven students from the University of Innsbruck, Austria, started in 2013 with great endurance and creativity to represent the interests of young chemists towards the Austrian Chemical Society (GÖCh), the chemical industry, and the public. They work to build a larger network among young chemists covering other Austrian universities and to expand their international cooperation with other young chemists' groups. Read more. 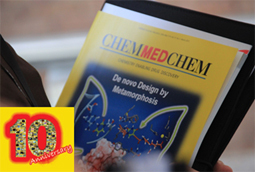 The inaugural issue of ChemMedChem was published in January 2006, and so the journal is currently celebrating its 10th anniversary. ChemMedChem's anniversary celebrations will be held later this year at the annual National Meeting in Medicinal Chemistry of the Medicinal Chemistry Division of the Italian Chemical Society (SCI) in Palermo (September 11–14, 2016). This is particularly fitting, as ChemMedChem succeeded Il Farmaco, a journal of the SCI. Chemists cooperated with artists, they visited each other at their workplaces, discussed their work, learned from each other. 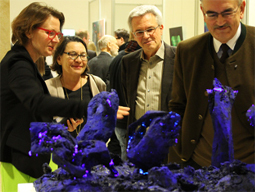 The result is a unique exhibition, well-received, which stimulates interest in chemistry and arts. Find out more. 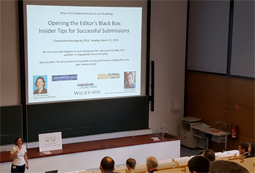 Research groups from the area have been visiting the Wiley-VCH offices in Weinheim to find out what really happens to their manuscript when they hit the "Submit" button. Discover more about this exciting initiative which aims to spread awareness of the role and activities of publishers in the publishing process. COPYRIGHT: © 2015 Wiley-VCH Verlag GmbH & Co. KGaA, Weinheim, Germany. All Rights Reserved.